This page took a long time, as I began to figure out the method I wanted to use to produce the detailing I like in my lineart. 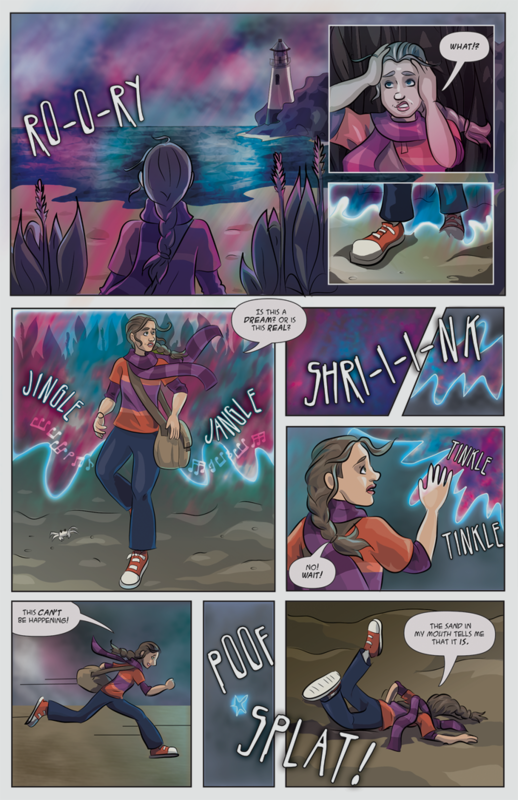 Lighting was much an experiment, and I've adjusted it a bit since originally working on the page since Rory looked "washed out". Rory has arrived at an ocean in the middle of a cornfield, and curiosity compels her to check it out. Unfortunately, the door she enters through closes behind her. Again, here, I'm using the aurora in much the way Philip Pullman uses it in his wonderful His Dark Materials trilogy (just one of the many "worlds" that has influenced this work). Rory doesn't think any of this is real until she gets sand in her mouth-which is rather unpleasant.